This investment case study will dig into many of the specific steps I take to buy, hold and sell great businesses for income and growth. But before I begin, I want to point out one thing. Annualised returns of 33.7% are NOT a realistic expectation for any investment in the stock market. The returns for this investment were extremely high because the UKVI portfolio only held the shares for 12 months, which means that the random movements of the stock market created abnormally high returns. If you go into the stock market expecting 20% or 30% per annum you are very likely to be disappointed. 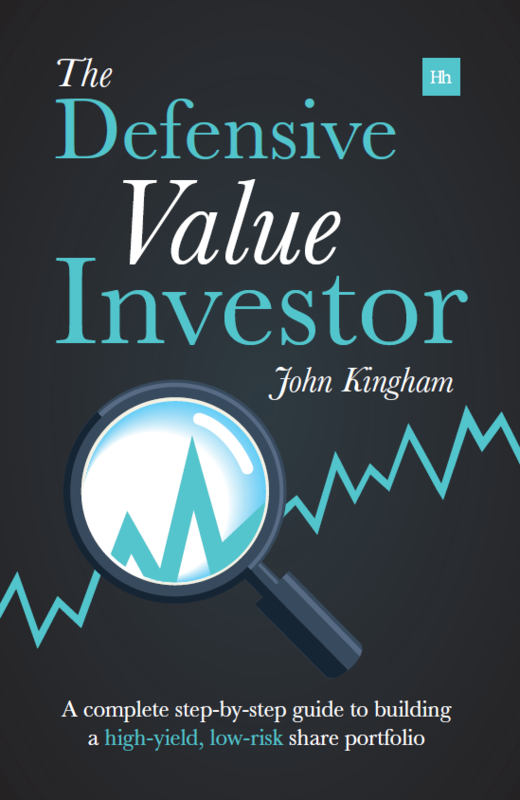 If you’ve been following my writings for any length of time you probably already know that I invest in ‘world-class’ businesses for income and growth using a relatively defensive value investing strategy. The goal is to manage a portfolio of outstanding businesses, where the portfolio always has a higher yield than the FTSE 100, and at the same time is able to grow that income faster than the index. That growing income stream in turn becomes the driver of future market-beating capital growth (although of course there are no guarantees). I bought UK Mail in October 2011 for 210p and sold it in October 2012 for 262.5p. During that time it also paid out dividends of 18.2p for a total gain of 70.7p, which is 32%, or 33.7% annualised. How did I work out what to buy, when to buy and when to sell? I have an investment process which I work through every month, either selling the most overvalued holding or adding a new undervalued investment from the market. This helps to constantly improve the portfolio, always pushing it towards more income, more quality and more growth. It also means that I don’t have to guess what I’m supposed to do next. October 2011 was ‘buy’ month, so that allowed me to focus completely on the task of buying the most attractive investment that I could find. Buying: Why pick UK Mail Group? UK Mail is the leading independent parcel, mail and logistics services company within the UK and a major alternative to Royal Mail for business mail requirements. If you’ve downloaded my free investment worksheets then you’ll know that I like to value companies based on their long-term financial results, so let’s start there. The results above are how things looked when I added the shares to the UKVI portfolio in October 2011. The average earnings per share in the period above was 21p and the average dividend was 17.7p. When I first looked at the company the shares were trading at 210p, which mean the shares were trading at 10 times the average earnings in the last decade, which is low, even for a company that isn’t growing. The dividend yield at the time was 8.6%, which of course is huge and is often a sign that the dividend is about to be cut. The next step for me is to check for debts and other obligations, to make sure that they won’t be a reason for the company to fail, or cut its dividend. In this case UK Mail had very little debt, with net interest charges of only £100k and pre-tax profits of around £15m, so the interest was covered by a huge amount. Looking back over the last decade’s annual reports as well as its current situation, I couldn’t see any obvious reason why that dividend was going to be cut. Looking ahead to the future, I couldn’t see any particular reason why the parcel and courier delivery business wasn’t going to just keep on ticking as it had in the past, for many years to come. On that basis my investment thesis was one in which the dividend would be maintained and the 8.6% yield would be enough to entice other buyers into the shares. This would eventually push the price up. Until that time I could sit back and collect the 8.6% income each year. One of the hallmarks of a good investor is that they don’t pay much attention to the stock market. What they tend to do is buy the shares of good companies at low prices and then get on with the business of owning those shares. What exactly does owning shares entail? Well, not very much. Generally it means reading the quarterly updates from management, watching the dividends accumulate in your cash account. Very occasionally you might check the share price just to see if the market wants to buy your shares back at an excessively high price. What it doesn’t entail is constantly watching the share price as it bounces around every day. What it also doesn’t entail is listening to every single piece of news that comes out about the company and trying to factor that into whether or not you should sell your investment. So with UK Mail I sat and held and received dividends, but eventually I chose to sell. Selling: Why sell if the shares are going up? A major part of my portfolio maintenance policy is to buy and sell on a regular, controlled basis. October 2012 was a ‘sell’ month, giving me the opportunity to free up some cash from my least undervalued investment. This cash will then be reinvested into what I think is the market’s most attractive opportunity the following month. What changed UK Mail from being attractive to unattractive? First and foremost it was down to the share price increase which had the knock on effect of reducing the yield. If the share price goes up the dividend yield goes down and at some point there may be better places to invest. With the shares at 262.5p the yield was just under 7%; still well above average, but far less attractive than 8.6%. 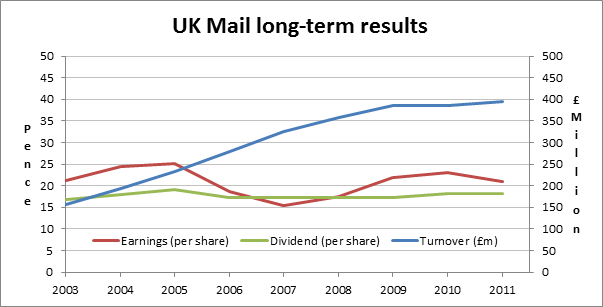 Add to that the minimal prospects for future dividend increases and, relative to the UKVI portfolio’s other holdings, UK Mail was less attractive than all the others. How do I decide which is more or less attractive? The process is the same as the one I use for buying. I compare the company’s long-term growth record, the quality and consistency of that growth, the current yield and the prospects for future dividend increase. It is the combination of current yield and future growth that defines how attractive an investment is. With growth of 0% and a yield of less than 7%, I now think there are better alternatives out there. This decision to sell has netted the portfolio a 33.7% annualised return from its short investment in UK Mail, which is far more than I would expect on average; however results like this are always welcome. I bought and sold the shares in a calm and methodical way, mostly looking at long-term economic fundamentals rather than buying and selling in an ad-hoc fashion driven by short-term news. 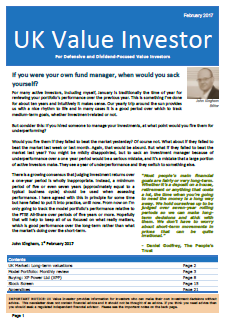 Great article on your investment process both from the buying and selling perspectives. 33.7% is an excellent return and shows that with the correct due diligence, investors are able to generate good returns. I understand your point about not expecting returns of 20-30% as this is unrealistic for most people. But a methodical, systematic value approach such as yours will, over the long term, generate good returns. Hi David, well that’s the plan! I think the less ad-hoc decisions an investor can make, the better the results are likely to be. I agree, which is why I make extensive use of a screener. I have to agree that from all investment ideas you have presented this was the only one I have acted on. I was buying from internet books and other things and from time to time they have delievered to me. It was and it is even now clear that the company was/is well placed to take advantage on this new trend. I would probably kept the shares a bit longer but I needed money for a new car. Hi Eugen, glad UK Mail worked out for you. I would also have probably kept the shares longer but needed to sell in order to increase diversification, but that’s fine as I’m happy with the returns anyway. I would warn about this investment with respect to the mail division of this company. Their is serious under capacity in the mail division, huge problems for customers being caused by this, serious lack of managment action acknowledgement and resoloution of serious issues. This is leading to them losing or on the verge of losing many six figure annual contracts. Those are interesting points, but as this case study shows, returns are driven by various factors and current issues within the company are not always that influential, and they’re certainly not predictable. However, thanks for the info, and if I’m looking to buy UK Mail in the future I’ll have a deeper look at these capacity issues.